Happy Friday, y’all! Are you in a summer mood? September has come… so it has! But we still yearn for the summer. Despite the heavy rains all over the world this year, summer is still here — and that still means vacations, beaches, light dresses, and open sandals. Time for unbridled fun and recreational activities, adventures and happiness. With the change of the seasons, why not spruce up your website or even desktop with some related icons? Symbols and Icons have great importance in graphic design. They can make a web page more acknowledged, define specific mood for the content, adjust the perception of the website, add another base for visualization. It is not uncommon icons to be used in web design as parts of the menus and other animated elements. Have a design project for this summer? Well, this icon set may be useful for you. 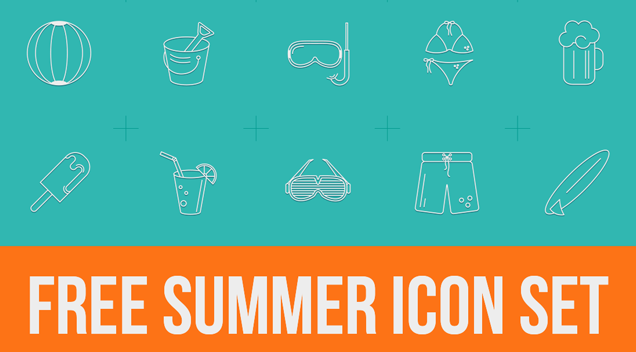 In today’s post we are featuring free summer icons for your designs. Perfect and useful for any project, like web and mobile apps projects. If you are working on a summer event or a web design project, then the below icon set may help you. It comes with holiday gear and it sends you straight to the beach: beach umbrellas, beach balls, soft ice cream, flip flops, folding beach chairs, cocktails, watermelon and the like. You should all download them and use them – hurry, before summer is over, because whether we want to admit it or not, it is winding down to an end once again. Any plans for celebrating the end of the season? Hope y’all get to do something fun and summery this weekend!